Family friendly and full of flavour, you won’t go wrong with our organic chicken drumsticks. We trim them by hand in our own butchery, so they’re ready to cook, no prep needed. Fantastic marinated in spices on the barbecue. 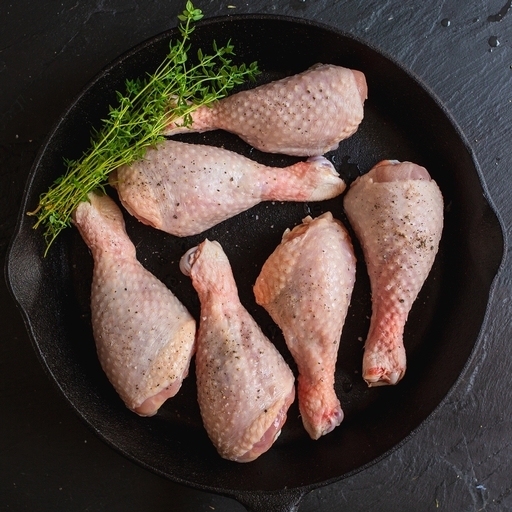 Organic and truly free range, these birds spending their time grazing freely outdoors - resulting in tender, really tasty meat. Approximately 6 chicken drumsticks per pack. Leg meat is arguably tastier than breast meat but requires more cooking time to tenderize. Season, oil and roast at 200˚C/Gas 6 for 15-20 mins, until the skin has started to colour nicely. Drop the heat to 180˚C/Gas 4 and cook for a further 30 mins, at least. They like a bit of water, wine or stock in the tray to help them along, and are cooked when the meat easily separates from the bone. You can grill or BBQ them in slightly less time: cut deep slashes into the flesh to help the heat penetrate, then cook for 30-40 mins on a moderate heat, nothing too fierce. Most of our chickens are raised by Andy Hayllor, one of our veg co-op farmers in Devon. The birds spend most of their time outdoors grazing grass, red clover and chicory; scratching and making dust baths, searching for bugs and exhibiting their natural behaviours. Chickens are naturally timid creatures and without encouragement, stay indoors and never learn to roam and scratch. Many birds labelled ‘free range’ are kept in houses of many thousands. In theory they have the option to go out, but very few actually do. By contrast, Andy’s organic birds live in small flock sizes. They have shelters to encourage them away from the house, which Andy moves regularly to encourage them to roam about. You might notice that the meat has a distinctive yellow colour. This isn’t from maize, but is as a result of their natural outdoor diet and lifestyle. It is proof that they really do ‘range free’. Short of raising chickens in your garden yourself, it would be hard to better these birds for flavour and welfare.